When I saw the recipe for this quick bread on one of my favorite food blogs, PreventionRD, yesterday, I just knew I had to make it. Pumpkin + gingerbread? A hit for sure! Nicole's bread looked fabulous but it looked like it focused more on the flavor of the pumpkin, and I wanted to make a true gingerbread loaf with just a hint of pumpkin...and that is what I got after I made a few changes to the recipe. You can find Nicole's delicious recipe HERE along with her gorgeous photography! Pumpkin is not the star in my version of this recipe...rather since it was written as a vegan recipe ( no butter, no milk, no eggs) it's roll is moisture...and it does a perfect job of it! Nicole is always saying how she loves vegan muffins and quick bread recipes because they are so moist! And she is 100% correct! The addition of candied ginger in the batter takes the ginger flavor over the top! But no worries, if you don't have candied or crystallized ginger, you can use golden raisins instead. I am a huge fan of gingerbread. I have a hard time resisting it when it shows up at Starbuck's around Thanksgiving. 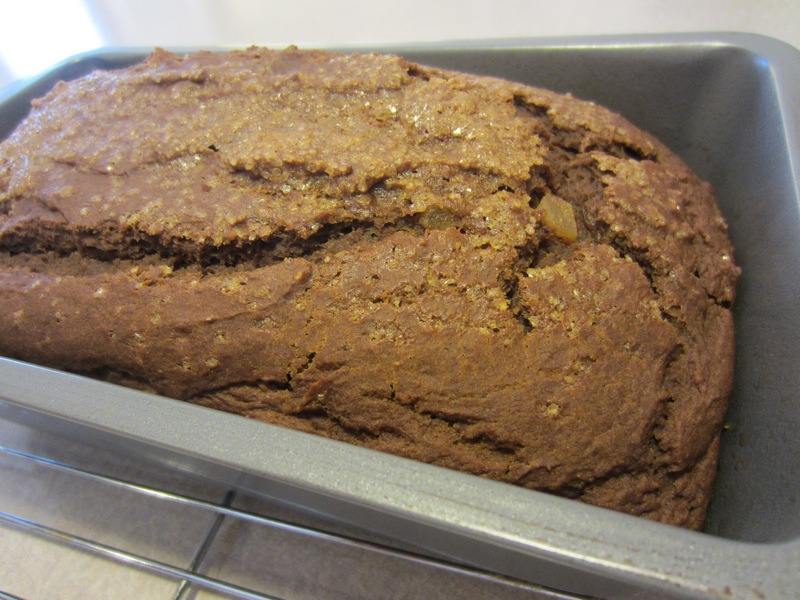 This recipe does not disappoint in the gingerbread taste department while still being fairly low in the fat and calorie department...and I am sure a huge difference from Starbuck's version! I divided up the loaf into 16 servings. I find it easiest to slice the loaf into 8 pieces and then cut each of those pieces in half for a serving size. With a warm cup of coffee in the afternoon, this moist and dense quick bread is the perfect treat! 1. Preheat oven to 375 degrees F. Spray 9 x 5" loaf pan with cooking spray ( I use Baker's Joy ). 2. In large bowl, combine the flour, baking soda, baking powder, sugar, salt, spices and orange zest. Set aside. 3. In med bowl or 4-cup glass measure, combine the molasses, canola oil, orange juice and pumpkin puree. 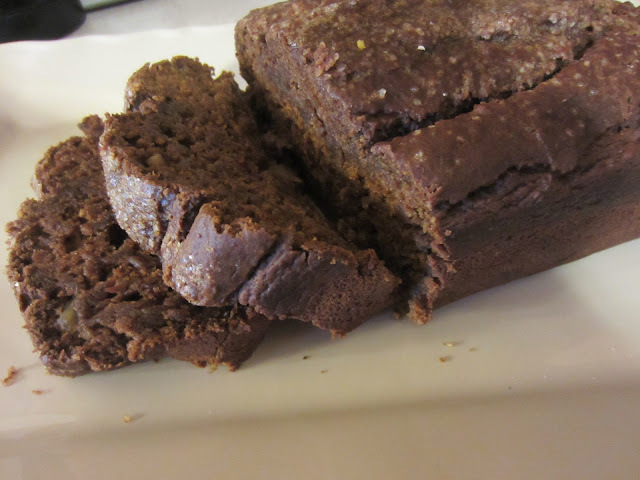 I really loved this version of this quick bread! Moist, dense, tender and spicy! Hard to believe that Halloween is just around the bend! I bought my candy to give out, and it is patiently waiting. The cost of candy has gone up so much, I didn't buy as much as I have in the past. I figure when I am out, I am out. It is a good thing not to have too much though, as there won't be tempting leftovers! How easy is it to pop one of those fun sized candy bars into your mouth without even thinking about it?? What is your strategy to keep your hands out of the candy this Halloween? I am not sure if my kids are going trick or treating this year ( they are getting to that age, ya know) and my daughter is away at college...so I don't suspect I will have stray candy to tempt me this year. But in the past years, I have always made the kids keep their candy out of my sight and up in their rooms. It worked most of the time! Don't forget to hop on over to FaveDiets October Blog hop and vote for my Split Pea and Smoked Ham Soup...if I get enough votes, I might win a Top Chef Cookbook that I would be willing to offer a chance for YOU to win on my blog! Sharing the love!!! Voting will end on Oct 27th! This is so tempting! I am a huge fan of gingerbread. It is something that my mom use to make quite often when I was a kid. We would get to have it warm out of the oven with a dab of cool whip and I loved every bite! I stopped passing out candy years ago when my kids were in braces. I would buy them each some of their favorite candy that they could eat with out harming their braces and then on Halloween we would go out to eat and go to a movie. We don't have a lot of trick or treaters in our neighborhood so it's not like I'm the crabby old lady who doesn't pass out candy! When I did pass out candy I bought stuff I didn't like - sweet tarts and stuff like that. No chocolate - that is too dangerous around me! HI Renee. I saw this on Nicole's site too. You and she are both amazing cooks who are always giving me great ideas for healthy eating. Have a wonderful day!!! Love your version of Nicole's bread! At my old house, I used to have about 300 trick or treaters - there was a school about 3 blocks away so kids would trick or treat on their way home - loved it! We moved to the house we are now 11 years ago. I had my arsenal of candy and we got . . . 3 trick or treaters. I was so disappointed! Turns out the houses on our street are too far apart, so the kids would go up the street to a different neighborhood. I'll never forget the last girl to come to my door - I told her to open her bag and I dumped about 8 bags of candy into her bag! As she ran to her Mom she was like "that lady gave me all her candy!" I can't wait to try your recipe...have all of the ingredients at home. We get quite a few trick or treaters, one of the neighbors has a party in his yard and we all get together there. Everyone brings their bowl of candy and when a trick or treater stops by they get about 5 houses worth of candy in one stop. Lots of fun! I looooove the idea of crystalized ginger in there, YUM! Glad you're on board with vegan baked goods! I do think the word "vegan" can scare people...but they just have to give it one go to be a convert!! Gorgeous pics, Renee! P.S. Hubby wants me to make more of your veggie soup soon...I LOVED it. We LOVED it. I saw this on Nicole's blog and pinned it! I, too, loooove gingerbread (anything ginger really!) I made pumpkin scones last year with crystallized ginger that were SO good (http://kim-thislittlelifeofmine.blogspot.com/2010/11/oooohh-yeahhh-it-was-that-good.html - if interested!) I really want to make this bread now! Renee, I don't think you ever post a recipe that DOESN'T sound amazing to me. My blog is going to turn into an MKA copycat!